There are many beauty treatments that are 100% safe to use during pregnancy. Some women face pregnancy with the idea that leaving behind beauty treatments is part of the sacrifice they must make for their baby. However, this could not be further from the truth. The sanity of a pregnant woman can be maintained with a few carefully planned beauty treatments to keep her feeling beautiful and collected while her body changes at a miraculous speed. One of the approved beauty treatments is eyebrow maintenance. Waxing is typically not suggested during pregnancy due to the chemicals in the wax that may be absorbed through the skin. 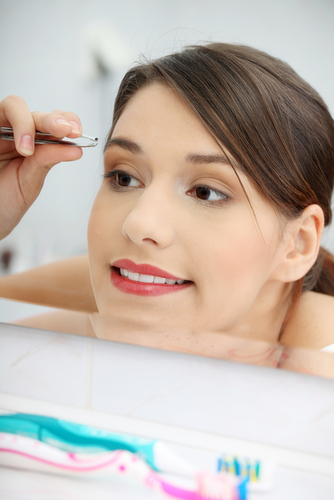 Tweezing and shaving of a unibrow during pregnancy is safe. Tweezing, or plucking, can be completed at home or at a salon. Most salons will not shave to shape a unibrow. If the unibrow appeared after becoming pregnant, it could be due to a darkening of facial and body hair. For some women, hair becomes darker after conception. The hairs affected can include facial hairs. Those light, fine hairs located between the brows can suddenly appear darker causing the unibrow look.